It is a story that I have told in my own writings and presentations, particularly in my book, The End of Money and the Future of Civilization, but the video below is well worth viewing. I’ve not been a big fan of Glen Beck, and I abhor the Fox network, which I consider to be a propaganda instrument of the global elite, but this particular program is ironically quite good at telling the story of the creation of the Federal Reserve, the banking cartel, and the collusive arrangement between the bankers and the politicians (that pattern was actually established with the founding of the Bank of England in 1694). Beck’s featured guest, G. Edward Griffin, the author of The Creature From Jekyll Island, is particularly astute in his observations. The conversation only goes astray toward the end when it turns to gold backing, a proposal that is based on a still naive conceptualization of what money is and how it works. Interestingly, Beck was fired by the Fox network shortly after this program aired, presumably for exposing the scam of the elite cabal that Fox is there to serve. Bank of Japan announces plan for massive inflation of the Yen, as US Fed curtails dollar monetization (QE). What does it mean for you? Thus, Japan takes over much of the burden of keeping a flawed global money system alive, as the US central bank (the Federal Reserve) ends its own program of dollar inflation. As I’ve pointed out before, “Quantitative easing” is simply a euphemism for inflation of the currency (mainly by central banks buying government bonds and other uncollectable debt). Other things being equal, currency inflation eventually leads to price inflation. But other things are not equal. The US has indeed seen significant inflation of prices in some sectors, especially food, but other prices are being kept down, primarily because of layoffs and underemployment, leaving consumers with lower incomes and reduced purchasing power. If income from wages and interest on savings are held down, people must either do without or borrow more money to maintain their levels of spending. The following table from the Federal Reserve shows the growth in consumer credit over the past few years. These figures cover most short- and intermediate-term credit extended to individuals, excluding loans secured by real estate. Those figures show a more than a 26% increase in consumer credit just over the past four and one half years, much of it high-interest credit card debt. Although credit card debt has declined somewhat from its 2009 peak, according to nerdwallet.com, falling indebtedness is largely due to defaults rather than repayment. Central banks find currency inflation necessary in order to offset the reductions in the money supply caused by charging interest on money that banks create when they make “loans.” There is never enough money in circulation to enable repayment of the aggregate of principal plus accrued interest of money created as bank “loans.” Thus the “natural” tendency of the usury-based debt-money system is toward deflation. Central governments then must become the borrowers of last resort and central banks become the lenders of last resort as bankers and politicians continue their absurd dance that is a death spiral of recurrent and ever more extreme financial crises. 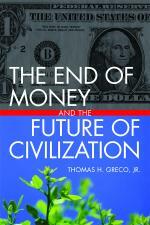 The real solution to our monetary, financial, and economic problems is to end the usury-based debt-money system. But the bankers, the rulers of the world, will not stand for that. By control of the money creation process, they have extended their power to tightly control the political process, as well. Thus, the wealth and purchasing power of the vast majority of people will continue to decline as the system continues to pump up the wealth and power of the few who control the money system, and their minions. So, what can people and communities do to counter these trends and regain control of their economic fortunes and enhance their political power? Considering the dynamics of power that prevail in the so-called democratic countries today, reliance on the political process to effect systemic reforms seems futile. So, while it is necessary to continue to protest the status quo and reframe the political dialog, it is even more important to take action to rebuild society from the bottom upward. We must reduce our dependence upon the very systems that are being used to disempower us, of which the political money system is foremost. That is not so daunting as it might first appear, and conceptually it is not very complicated. It is what my work of the past quarter century as been all about. The biggest difficulties have had to do with dispelling erroneous myths about money and banking and helping people to see beyond the orthodox. This, and the lack of adequate tools have retarded the process of taking promising alternatives to scale, but that is quickly changing as new technologies that enable moneyless trading become available. But don’t sit idly by waiting for things to happen “out there.” Start with your own personal development and empowerment, while working to strengthen your various communities and networks, your city, state, and region. Some tips to get you started can be found here. –t.h.g. Who buys US bonds when foreign countries and investors won’t? Question: Where does the Fed get the money to buy the bonds? That’s right, the Fed has no money, but the Congress long ago empowered the Federal Reserve Bank to create money by buying government (and other) securities. This is known as “monetizing the debt,” which amounts to nothing more than “legalized” counterfeiting of dollars, and it has the same results as the injection of any other form of counterfeit money—the dilution of purchasing power of all the dollars already in circulation and the erosion of the value of all dollar-denominated assets. You can find out more about that, along with some pretty good analysis in an article that appears on the Money News website. “Quantitative easing,” it sounds like something you might do over the toilet. It’s an ironic but appropriate choice for a euphemistic expression designed to fool the people in the hope we will not realize what is really being done to us by the banking and political powers that be. “Quantitative easing” is monetary inflation, pure and simple. The dollar is being intentionally flushed down the toilet. Get rid of your dollar denominated savings and investments before their purchasing power shrinks to nil. Why are we not surprised? Senators voted down the Vitter Amendment to audit the Fed, 62 to 37.
Who does your senator work for?